Following this morning's formal announcement from Apple about the WWDC '11, a number of reports surfaced indicating this year's conference will be a software-related event, with the focus on iOS and Mac OS X Lion. Several bloggers and journalists have reported there won't be a single hardware announcement at the WWDC, meaning a new iPhone -- for the first time in years -- won't be announced at the June event. Such an announcement, of course, lead many to speculate what features of iOS 5 (Lion has already been demoed and released as a preview to developers) will exactly make their way to the WWDC stage. TechCrunch now reports Siri, the startup bought by Apple last year, will play a big role in iOS 5 and a first demo of the integration of the technology will be shown at the WWDC. Oh, and one more thing. Following our report on iOS 5, we heard a tiny bit more about it. The use of Siri’s artificial intelligence and assistance technology is said to be deeply integrated into the OS for all the different services offered. And the team is now putting the finishing touches on the elements that will be demoed at WWDC, we hear. This tech may also be opened to developers for use in third-party apps — though that information isn’t quite as concrete. The Siri iPhone app is still available in the App Store for free, and it allows users to "speak" to their iPhones to book restaurants, movie tickets, taxis and much more. Siri is undoubtedly a great piece of technology and this rumor, combined with previous reports of Apple looking to improve speech recognition functionalities and navigation in iOS, certainly backs up the theories of Cupertino engineers building a completely new OS focused on speech, new maps and more "human" interactions. Another report by TechCrunch yesterday pointed to iOS 5 being released this fall with new location and music services. With an iOS 5 beta (likely) to become available at the WWDC in June and the time needed for developers to update their apps, it makes sense for Apple to wait until their usual September music event to launch the new OS and cloud services. In the meantime, you can check out the old Siri demo video and product description below. 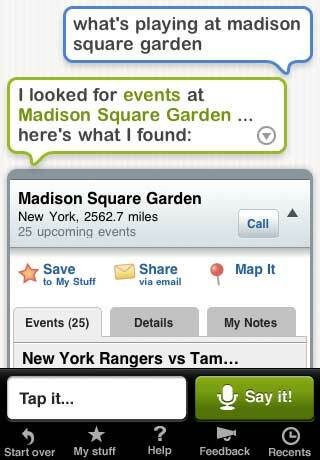 Today, Siri can help you find and plan things to do. You can ask Siri to find a romantic place for dinner, tell you what’s playing at a local jazz club or get tickets to a movie for Saturday night. Siri is young and, like a child taking its first steps, may be awkward at times. Siri may occasionally misunderstand things you ask it to do even within its range of understanding. Nonetheless, Siri will improve quickly by getting to know you better and understanding a broader set of tasks. In fact, right now, Siri’s learning how to handle reminders, flights stats and reference questions. Our vision is that, over time, you’ll trust Siri to manage many personal details in your life - from recommending a wine you might enjoy to managing your to do list.